Welcome to the Homepage of the International Journal of knowledge, Innovation and Entrepreneurship, the associate journal of the International Conference on Knowledge, Innovation and Enterprise (KIE Conference). The International Journal of Knowledge, Innovation and Entrepreneurship is dedicated to the advancement of studies in knowledge, innovation and entrepreneurship and provides a forum for the publication of high quality papers in these coverage areas. 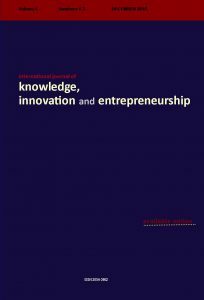 Launched a decade ago originally as an occasional papers series, the International Journal of knowledge, Innovation and Entrepreneurship brings together scholarly work in knowledge-education, creativity, organisation, management and technology innovation, and entrepreneurship. The journal aims to promote interdisciplinary studies in business and technology and aims to become a leading journals in the area. The journal will publish original research and papers that discuss, analyse or evaluate policies, or those that disclose relevant gaps in existing research. The journal is published thrice a year, April, August and December; those three issues constitute a volume. IJKIE welcomes proposal/s for special issues or conference edition. Please note that special issues and/or conference proceedings may have different peer review procedures from the process highlight above, involving, for example, Guest Editors, conference organisers or scientific committees. Authors contributing to these projects will receive full details of the peer review process from the conference or Guest Editor/s in question. Want to be a referee for the IJKIE journal? The International Journal of Knowledge, Innovation and Entrepreneurship is seeking to expand its pool of referees to review articles submitted to the journal. If you are interested, please send your name, e-mail address, curriculum vita, and keywords for your areas of expertise to the Editors. There are benefits of being a referee for IJKIE. For instance, The benefits of refereeing for IJKIE gives you the opportunity to see and evaluate the latest work in your area of research at an early stage. You would be acknowledged in an annual statement by the editors in the journal. Also, you would be able to cite your work for the The International Journal of Knowledge, Innovation and Entrepreneurship as part of your professional development requirements for your organisation or professional body. The journal evaluates papers based on four main criteria as follows: The subject matter must be of critical importance to the education (knowledge) enterprise and technology communities; the research question/s must fall within the IJKIE’s scope and the research itself must be well designed and executed; and on the whole the paper must be well presented – well written and conforming to the IJKIE’s style.